It has long been known that almost all elite athletes use imagery and that most sport psychologists apply imagery in working with athletes. But most material on the subject has been, to this point, relegated to single chapters in books, to journal articles, or to conference proceedings. Imagery in Sport takes complex theories and presents them clearly, using examples from everyday sport contexts. The book helps readers become familiar with the current knowledge about the topic and learn to view it with a critical eye. And it provides practicing sport psychologists with guidelines and strategies for using imagery to help athletes improve their performances. Chapter 2. Definitions: What Is Imagery? Chapter 3. Theories: How Does Imagery Work? Which Factors Influence the Effectiveness of Imagery? How Much Imagery Is Enough? Is Imagery Research in Its Own Little Dream World? A reference for researchers, sport psychologists, and motor learning and control specialists; a text for graduate students in sport psychology. Tony Morris, PhD, is a professor of sport and exercise psychology at Victoria University in Victoria, Australia. 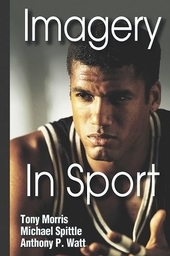 Morris has published widely on imagery in sport and is known as the leading researcher on the topic. He has authored numerous book chapters on imagery in sport and is the author of one of the leading texts on sport and exercise psychology as well as an authoritative reference text on the status of sport psychology around the world. He has held numerous positions with national and international sport psychology associations, including president of the Asian South Pacific Association of Sport Psychology since 1999 and treasurer of the International Society of Sport Psychology since 2001. Michael Spittle, PhD, is a lecturer in motor behavior at the University of Ballarat in Victoria, Australia. His current teaching includes motor learning, motor control, sport and exercise psychology, measurement and evaluation in human movement, and cricket, as well as supervision of several postgraduate students. Spittle has a Physical Education and honors degree from Victoria University, a postgraduate degree in psychology from Deakin University, and a PhD from Victoria University in the area of imagery perspectives and performance of open and closed motor skills. He has participated in and enjoys many sports and activities including cricket, Australian Rules football, soccer, surfing, running and fitness training. Anthony Watt, PhD, is a lecturer in physical education at Victoria University in Victoria, Australia. Under Dr. Morris he completed his PhD work in 2003 in the area of assessment of imagery ability in sport. In addition to his lecturing, he cosupervises doctoral students working in the area of imagery use in sport. Watt has extensive background in physical education and sport, in which imagery has been examined.